William Graham [1817-1885], London. Robert Henry [1850-1929] and Evelyn Holford [1856-1943] Benson, London and Buckhurst Park, Sussex, by 1901; sold 1927 to (Duveen Brothers, Inc., London and New York); sold 1 October 1928 to Clarence H. Mackay [1874-1938], Roslyn, New York; sold to (Duveen Brothers, Inc., London and New York); purchased 15 December 1936 by The A.W. Mellon Educational and Charitable Trust, Pittsburgh; gift 1937 to NGA. Ellis Waterhouse, in a note of 22 July 1980 in NGA curatorial files, suggests that the painting may have been lot 177 (Florentine School, Virgin and Child, bought by Colnaghi) in the Graham sale at Christie, Manson & Woods, London, 2-3 and 8-10 April 1886, 3rd day; nos. 167 and 169 (both listed as Unknown, Virgin and Child) are also possible candidates. Bernard Berenson, Lorenzo Lotto: An Essay in Constructive Art Criticism, London, 1901: 52, note 1; Tancred Borenius, "La mostra di dipinti veneziani primitive al Burlington Fine Arts Club," RassA 12, no. 6 (June 1912): 89. Duveen Brothers Records, accession number 960015, Special Collections, Getty Research Institute, Los Angeles, Series I Business Records, New York Sales Lists 1922-1928.
] The original Duveen Brothers invoice is in Gallery Archives, copy in NGA curatorial files. Exhibition of Works by the Old Masters. Winter Exhibition, Royal Academy of Arts, London, 1910, no. 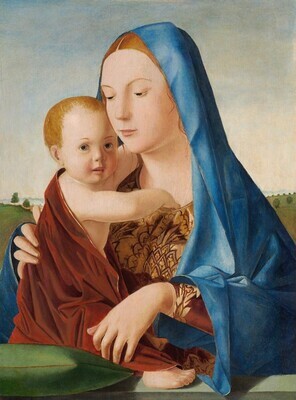 32, as Virgin and Child by School of Vicenza. A Collection of Pictures of the Early Venetian School and Other Works of Art, Burlington Fine Arts Club, London, 1912, no. 31 (no. 13 and pl. XII of illustrated catalogue titled Early Venetian Pictures and Other Works of Art). Loan Exhibition of the Benson Collection of Old Italian Masters, City of Manchester Art Gallery, 1927, no. 37. Berenson and the Connoisseurship of Italian Painting, National Gallery of Art, Washington, D.C., 1979, no. 1, repro. Antonello da Messina, Museo di Arte Moderna e Contemporanea di Trento e Rovereto, Rovereto, 2013-2014, no. 18, repro. Benson, Robert Henry. Catalogue of Italian Pictures at 16 South Street, Park Lane, London and Buckhurst in Sussex. London, privately printed, 1914: no. 71. Duveen Brothers. Duveen Pictures in Public Collections of America. New York, 1941: no. 69, repro. Preliminary Catalogue of Paintings and Sculpture. National Gallery of Art, Washington, 1941: 7, no. 30. Paintings and Sculpture from the Mellon Collection. National Gallery of Art, Washington, 1949 (reprinted 1953 and 1958): 31, repro. Cairns, Huntington, and John Walker, eds., Great Paintings from the National Gallery of Art. New York, 1952: 48, color repro. Shapley, Fern Rusk. Catalogue of the Italian Paintings. 2 vols. Washington, 1979: I:16-17, II:pl. 10. Walker, John. National Gallery of Art, Washington. Rev. ed. New York, 1984: 118, no. 101. color repro. Boskovits, Miklós, and David Alan Brown, et al. Italian Paintings of the Fifteenth Century. The Systematic Catalogue of the National Gallery of Art. Washington, D.C., 2003: 36-41, color repro.